ve čtvrtek 10. prosince 2015 od 16:30 hod. Houses for the Gods “For Sale”. is a postdoctoral research associate at the CEFRES. She obtained her Ph.D. in social anthropology from EHESS-LISST CAS, Toulouse. 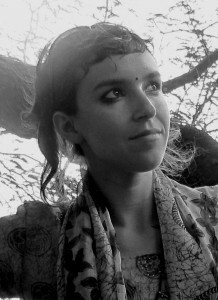 Her dissertation focuses on transformations of the ritual practices of the Sora, a tribal group of central eastern India. She was recently based in the USA as a postdoctoral research fellow at Yale. She is currently interested in the emergence of Tribal/Adivasi art in India, the elaboration of new religious identities facing dominant religions, and the issues raised by the appropriation of writing and other communication media by marginalized groups in a post-colonial context. Among the Sora tribe (Odisha-Andhra Pradesh) one finds mural paintings in front of which sacrifices are performed. These images are considered to be houses for deities whose presence is thus materialized in the domestic space. Their designing is part of a ritual which requires close collaboration between a painter and other religious specialists who, through songs, invite local deities to inhabit the pictures. But these “altar-paintings” may be disconnected from the converging agencies set in motion by the ritual. As cultural emblems displayed in regional museums or as articles for sale in “tribal markets,’’ or even as animated movies used as political instruments denouncing the abuses perpetrated against Adivasi/Tribal groups, Sora paintings inspire a large range of modern-day media. We will follow the journey of these images which traverse cultural, ethnic, and national boundaries.